It's engagement season! And this is the big engagement ring trend for the new year. This time of year is the most popular time to propose. More men get down on one knee in the time between November 1st and February 28 (or 29) than in any of the other months. You're not surprised, of course. You are already expecting the barrage of excited announcement to clog up your social media feeds over the coming months. I got engaged in November, on the weekend of the Toy Show as it happens. My now husband thought it was a good time because there was a jovial feeling in the air but it wasn't quite Christmastime - and we got to celebrate our engagement for the whole of December! They might propose in January on a sun or ski holiday and February? Well, that one is obvious. Engagement rings are hugely tricky, of course. You might love the idea of a 'vintage' ring passed down through the generations. You may have always dreamed of designing your own. Or maybe you've your eye on a celebrity style. It is all down to taste, really. My engagement ring is small and dainty and unlike anything I thought I would like. Because that's the other thing; you never know if it will suit you till to try it. That's why engaging (not apologising) with trends is adding another layer of tricky to the whole business. Trends absorb into your psyche. You love something for the time it's in fashion, like, love it, but then a new trend comes along and it's relegated to passe status. The engagement ring trend for 2019 is definitely something you'll love or not love. (Then you'll grow to love it because it's everywhere and then you'll hate it.) However, it does have the benefit of being quite cool and has the possibility of becoming a classic. So, what is it already? The signet ring is traditionally one with a design or letters carved into it. 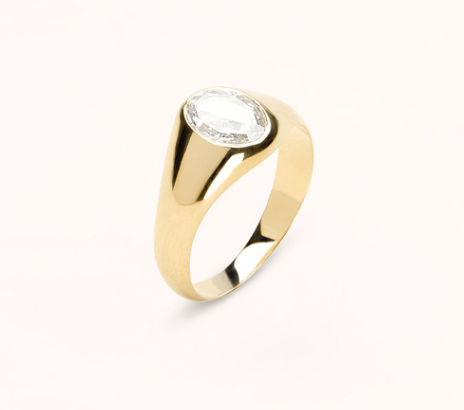 It's known as the 'gentlemen's ring' as it's the style worn by men to represent their family heritage. It's also known as the 'seal ring' because the engraving could be pressed into wax to seal documents (you've seen it done in period dramas). The engagement ring version, of course, has a stone (or not). I love 'masculine' jewellery on women - chunky watches and thick chains - and this style of engagement ring could be absolutely stunning. What do you think? Could this be just the cool and unusual engagement ring you've been dreaming of? Rosie Huntington-Whiteley and Jason Statham engaged! Poll: Is Audrina's Engagement Ring Brilliant or Bust? Get by with a little help from your mega star friend.